1953 was the year that Elvis Presley recorded for the first time but it would be another two years before he graced an American chart. 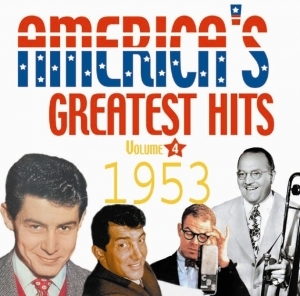 The biggest hits of 1953 were still in the hands of balladeers and Orchestra leaders. Frankie Laine?s quasi-religious ?I Believe? was the years biggest hit despite peaking at No2. In the UK it topped the charts for 18 weeks, a record that still remains unbeaten over 50 years later. The year began with the January 1st death of Country superstar Hank Williams whose songs were covered by many pop stars and 1953 was no exception with Joni James version of his song, ?Your Cheating Heart?, scaling the charts. Country crossover was also present in the years first No 1, Perry Como?s, ?Don?t Let The Stars Get In Your Eyes?. The ever increasing power of Television is evident in the No 1 success of the theme from ?Dragnet? and more surprisingly Stan Freberg?s satire on the TV show, ?St George & The Dragonet?. In all this volume features 10 No 1 hits and another 15 titles that reached the top 4.